Community and Service is at the heart of the International Baccalaureate (IB) programme. The Codrington School is an International Baccalaureate (IB) World School which is authorized to offer all three of the IB’s ‘gold standard’ educational programmes: the Primary Years Programme (PYP), for children generally aged three through eleven; the Middle Years Programme for students generally aged between 11 and 16; and the Diploma Programme (DP), for young people generally aged 16 through 18. The school currently has learners from 28 different nationalities. Its well-qualified teachers come from eighteen different countries. It is an international school whose philosophy and practices model and reflect those of the IB, particularly stressing adherence by all members of the school’s community to the IB’s learner profile. 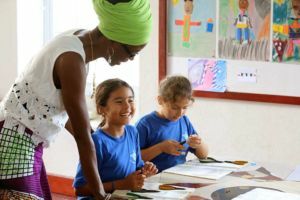 Superior teaching enables the school to offer a liberal, progressive IB education, based on solid research and best practice from all over the world, including our host nation of Barbados. The Codrington School is an exciting and interesting place for children to grow and learn. Small class sizes, good facilities, supportive parents and motivated students help create a positive learning environment in the classroom; a place where students can achieve their potential. The mission of The Codrington School is to empower all children and adults within the community to become internationally-minded learners who embrace and respect academic excellence and a love of life-long learning and who exemplify the traits of the IB learner profile. 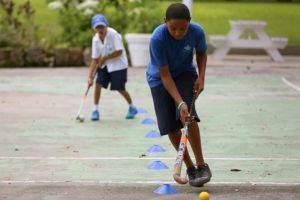 We believe that The Codrington School is a community of internationally-minded learners, both Barbadian and foreign and both children and adults, which is committed to the success of each individual child, according to that child’s age, aptitudes and abilities, whilst developing in each person the qualities outlined in the International Baccalaureate learner profile. We further believe that all students at the school should be offered the opportunity to learn in an atmosphere of trust, security and high educational standards, without either the threat of or recourse to corporal punishment, which will enable them to be well educated in all disciplines offered by the school, whether curricular or enrichment activities. The structure of the IB programmes are designed to provide all students with common understandings of key terms and tenets, while allowing schools to creatively use their resources to provide experiences that meet the needs of their student body. Not all IB schools look and feel the same around the globe; however, students in IB schools do gain a shared awareness of what it means, for example, to be internationally-minded, to value and cultivate human ingenuity, to hone and make use of transdisciplinary skills, to approach learning with attitudes that yield optimum results, and to assess one’s learning in a myriad of ways. The Codrington School, The International School of Barbados is an IB World School and is authorized to offer all 3 International Baccalaureate Programmes: Primary Years Programme (PYP), Middle Years Programme (MYP), and the Diploma Programme (DP) To find out more about the International Baccalaureate Organisation and the IB programmes, please visit the IBO website. Under the Education Act (1981) The Codrington School is an approved school here in Barbados; this approval was granted by the Ministry of Education & Human Resources. The Codrington School, The International School of Barbados is a member of the Council of International Schools. The Council of International Schools is a premier worldwide accreditation organisation for international schools. Full details on the Council of International Schools can be found on their website www.cois.org. The campus offers large, landscaped and wooded recreation areas with park benches, basketball court, a soccer field, a tennis court, and gardens. There is also a separate playground for PYP 2-4 students. Indoors, the facility features 20 classrooms, a library, a community hall, a computer lab, and two science labs, all with wireless Internet access.